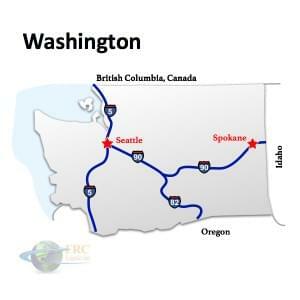 Washington to Maryland Freight shipping and trucking services are in high demand; Seattle to Rockville is a very heavily traveled route. The Seattle, WA to Rockville, MD shipping lane is a 2,742 mile trip that takes more than 41 hours of driving to complete. Shipping from Washington to Maryland ranges from a minimum of 2,397 miles and over 36 hours on the road from Spokane, WA to Indian Springs, MD, to over 2,983 miles and a minimum of 45 hours on the road from Bellingham, WA to Stockton, MD. The shortest route from Washington to Maryland is along the I-94 E corridor; however there is a more southerly route that uses the I-80 E, traveling through Ogden, UT and Lincoln, NE. Washington State’s nickname, “The Evergreen State,” doesn’t do justice to the vast geography of this Pacific Northwestern state. Although lush rainforests do flourish in the central part of the state, glaciers, islands and fjords are part of the state’s Pacific Coast landscape, while the Cascade Mountain range is found in the drier, eastern area. Likewise, the rain that the Washington’s most populous city, Seattle, is known for is not typical of the whole state. A dry, semi-arid climate is found in the east, while the mountains are known for deep snows in the winter that make snow chains a November to April requirement for trucking and freight services operating in Washington State. Washington freight and shipping is concentrated in Seattle and along the coast, and Spokane is a smaller center for Washington freight and trucking. Maryland is a densely populated state in a densely populated part of the country, so it is well served by interstate highways such as the I-68 and the I-95. Traffic in Maryland can be heavy, and good logistics and planning are especially important in Maryland trucking. Maryland’s adjacency to Washington DC has had a huge effect on its economy. Defense and biotech are important industries in Maryland, and Maryland produces both high tech products like electronics and chemicals and traditional products like coal and steel. FRC Logistics serves clients with a wide variety of specialized shipping requirements in the state of Maryland. For example, Maryland electronics companies may require temperature-controlled shipments of fragile electronic components, while Maryland steel fabricators sometimes need special provisions for over weight, over dimensional structural steel columns and girders. Washington to Maryland Freight shipping quotes and trucking rates vary at times due to the individual states industry needs. Since Washington is mainly agricultural, and Maryland is mostly industrial, with many food processing and distribution centers, we see plenty of shipments by refrigerated trailer. We also see a number of flatbed shipments as well as by the more common dry van trucks. Our Less Than Truckload (LTL) carriers in both Washington and Maryland are also running a number of regular services between the two states, and it’s an active route for heavy haul freight shipments, as well.